By almost any measure, the 2011 college football season continued the trend of increasingly dominant offenses and high-scoring and high-yardage games. Oklahoma State, Baylor, and Houston all averaged more than 550 yards of offense per game en route to historic seasons. And the BCS bowls will feature dynamic offenses and quarterbacks, including Russell Wilson and Wisconsin; Chip Kelly’s ludicrous-speed Oregon attack; Brandon Weeden, Justin Blackmon, and the high-flying Oklahoma State Cowboys; and quarterback Andrew Luck’s swan song as captain and resuscitator of a once-moribund Stanford program. Whether pro-style, Air raid, or spread-to-run, we’re living in offense-dominated times. That is, except in the game that (rightly or wrongly) crowns the champion: LSU-Alabama. Indeed, that game features the country’s most dynamic and exciting defensive player in Tyrann Mathieu (who might end up no better than the third- or fourth-best NFL prospect in LSU’s secondary) and one of the most statistically dominating defenses of the past decade in Alabama. There will be plenty to say about this matchup in the coming weeks. (Especially since the teams have already played — or hadn’t you heard?) But for now, despite all of the above evidence of offenses’ increasing dominance, because those offenses were in turn dominated by LSU’s and Alabama’s defenses there is no choice but to declare this season the year that, channeling William F. Buckley, those two teams stood athwart the march of history yelling, “Stop!” It was the year of defense. LSU was the undefeated team and its defense was more dynamic in terms of turnovers and big plays, but Crimson Tide coach Nick Saban’s carefully crafted Alabama attack was equally devastating. We’ll look at a play from Alabama’s 38-14 win over Arkansas to show how the defenses not only overwhelmed offenses but also confused them. 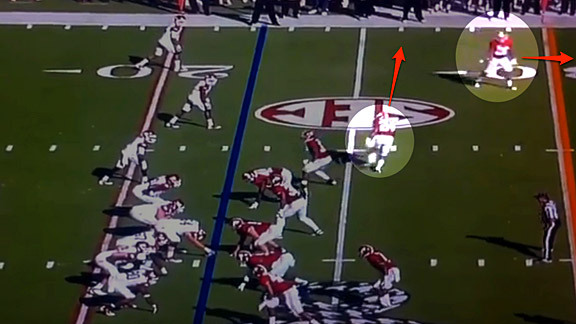 Just before the snap, you can see the alignment that Arkansas quarterback Tyler Wilson saw, along with the eventual movements. 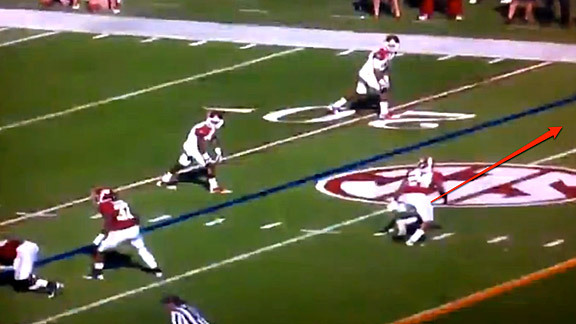 The Razorbacks lined up in a trips left formation with a tight end right, while Alabama showed two safeties deep with the cornerback to the top of the image lined up over receiver Greg Childs, showing short “press” coverage. 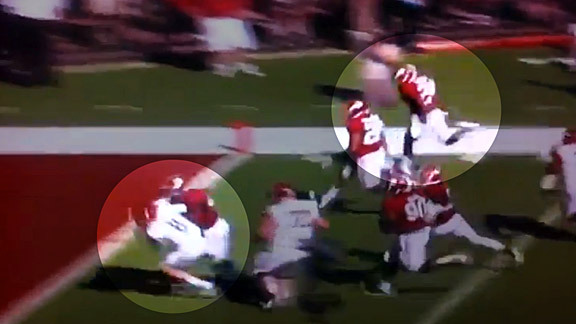 This looked like classic Cover 2 with multiple guys also showing a potential blitz. As a result, Arkansas called up a good but quick-hitting pass concept against that coverage, a “levels” concept, with two receivers running short in-breaking routes and another running an in-breaking route deeper, at 10 or 12 yards. In typical Saban style, though, what you see is not what you get. Just before the snap, the coverage suddenly changes. That “press” cornerback bails to the deep third while the other two safeties rotate away from the trips — it’s three-deep or Cover 3, not Cover 2. To make the coverage sound, defensive back DeQuan Menzie sneaks out to the sideline. What makes it even more of a wrinkle is that, based on his previous alignment, one would have expected Menzie to play his coverage inside to out (i.e., taking away the inside throws but giving up the outside ones). This seems to be what Wilson expected. Instead, Menzie rotates so far to the sideline that he plays with outside leverage on the receivers. The result is miscommunication between the quarterback and receiver. Arkansas receiver Childs, seeing Menzie’s outside leverage, continues inside on his short in route, while Wilson, expecting Menzie to be playing from the inside to out, drills the ball to what he expects to be Childs’ outside shoulder. 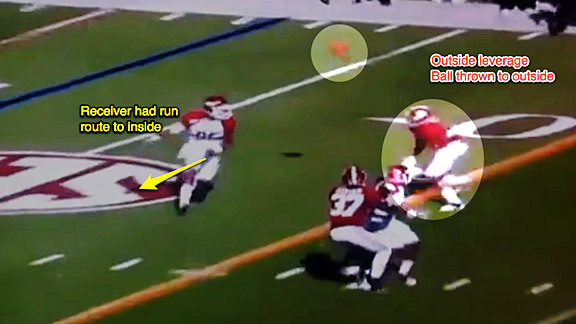 Instead, the ball basically hits Menzie in the hands, and he catches the deflection. And when you turn the ball over against Alabama or LSU, two things usually happen: The defense smells blood and it is an all-out race to the end zone, and there’s a good chance your quarterback is going to be flattened by some blockers. Before this pick, Arkansas was within three points. It would never get so close again. This is how these teams do it, too. 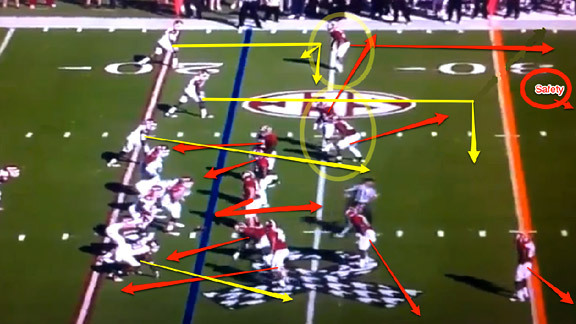 Great talent, yes, and sure, Saban and LSU defensive coordinator John Chavis can draw up some funky schemes, but what makes it go is how sound these schemes play in these highly disguised, roving defenses. Defense is about speed, technique, and, maybe more than anything else, communication. And both of these defenses certainly have a lot to say.